Old Fitzgerald's 1849 Kentucky Straight Bourbon Whiskey is the perfect marriage of age and proof-aged eight years in wood, 90 proof. Each barrel of Old Fitzgerald's 1849 is registered and aged in the unique Kentucky climate of continuity and product quality. The bouquet is described as rich with hints of oak, butterscotch, and mint. The taste is mellow and sophisticated with fruity sweet and crisp overtones. The finish is soft, long and soothing. 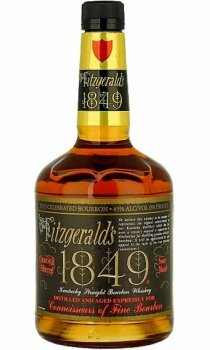 Old Fitzgerald's 1849 is the ideal whisky to sip straight, over ice, or with just a splash of water.